Opening Lines: "The New Mexico sun blazed hot through my window, spotlighting my mostly packed suitcase on the floor." Hello There, I'm Coming Home is the third book in the Hello There trilogy. I've had the pleasure of reading the second book Hello There, Do You Still Know Me, but have not read the first book. Although each book involves a new adventure for Madison and her friends, to completely enjoy the series I'd recommend starting with the first book, Hello There, We've Been Waiting For You! I'm Coming Home appears to draw together all three of the books and ends with a wonderful heartfelt conclusion. In book one, Hello There, We've Been Waiting For You! Madison moved in with her grandmother, Florida Brown, in Truth or Consequences, New Mexico after her mother died. In the second book of the series, Madison and her friends used the MegaPix 6000, a magical T.V., to portal back in time to search for a cure to save her grandmother from an unexpected illness. 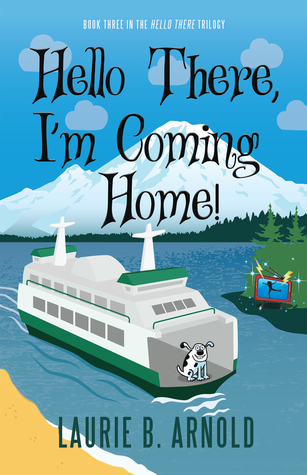 In the newest addition to the series, Madison is headed to Bainbridge Island, in Washington State to see her hometown and visit with her best friends Noah, Violet, and Rosalie Claire. Meanwhile, her grandmother Florida is headed to Florida with Grandpa Jack for a little R&R. On the morning of her trip, Madison finds a mysterious photo in her magic fanny pack. There's something about this sad looking boy wearing a hoodie that makes her feel like he is in trouble and could really use her help. If only she could see his face in the photograph. Once Madison is reunited with her friends, she gets the first hint to the boy's identity when she glimpses an iconic symbol from Pikes Place Market in the photo, so staking out the Market is their first order of business. The story is also about Madison coming back to her hometown after being gone for a while. It captures that feeling of coming home or seeing the places you remember again for the first time. Sometimes with fresh eyes. Madison reminisces about moments she shared with her mother, the stores they frequented, street signs she recognizes and ventures to her childhood home, a place she hasn't visited since her mother died. All aching reminders of how much she misses her mother. You feel Madison's grief over her mother's death, how being here is difficult for her. Bringing up old memories is hard. There's a really sweet moment when Madison looks up and sees the clouds and she can't help thinking of her mother up there watching down on her. It reminded me that I feel the exact same way every time I see a train, how simply seeing that object causes me to smile and fondly remember a person who was so important to me. When the boy from the photograph turns out to be Madison's estranged father now turned teenager, she is thrown for a loop. For the longest time, she had thought she was an orphan. Then to find out that her father is stuck as a sixteen-year-old kid because his magical shapeshifting amulet was stolen, is a lot to digest. Plus who wants their dad to be stuck close to their age? And it also brings up some interesting questions, like if her dad becomes an adult again how will that change her life? On the one hand, Madison really wants to reconnect with him and get to know him better but finds herself struggling to reconcile what her father is telling her about mother with who she knows her mother to be. Can she believe him? As I said in my review of book two, I really like the premise of using the MegaPix 6000 to portal into a T.V. show, it makes the magic system relatable and entertaining. I've often wondered myself what it would be like to step into a painting or to travel back in time, but a television show also sounds like a lot of fun to me. Madison teleported into a magician's televised magic performance, but me, I'd love to step into Downtown Abbey or maybe even Happy Days if I had the chance. I also really liked that Madison couldn't alter the past or undo her dad being transformed into a kid. That she had to bring the events into the present to fix the mistake. The characters are easy to relate to and their emotions and actions seemed natural. For example, the way Madison felt awkward when Violet started to have feelings for Noah and she wanted to know if he felt the same way. Plus, I'm a sucker for a happy ending and especially love how the series felt complete. Favorite Line: "Magic is like life. It doesn't come with guarantees. But it always comes with possibilities." Aww, thanks for commenting Laurie. All the best on your future book projects. When I was a little girl watching Star Trek, I always thought we'd be able to do such things by the time I was a grownup. Oh well. We can always read wonderful books like this one, and teleport to our heart's content. Hi! I'm Brenda. Log Cabin Library is my little space to share my thoughts on the Middle-Grade and YA books that I'm reading. Hope you'll find something here you enjoy and feel free to leave a comment. August 21st 2019: Call for judges!! !